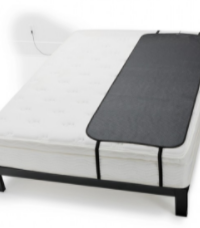 Sleep Mat made with Hole Punch Black PU Lookalike Leather (Not real leather). VEGAN-FRIENDLY! 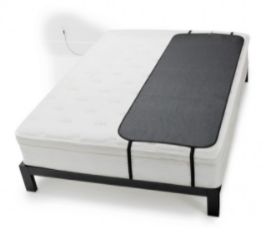 Place the mat on your mattress under a fitted sheet with the snap nub facing down, Earthing Label facing up, the straps will fit around the mattress to hold the mat in place . Attach snap end of Earthing cord to snap nub on mat. Attach other end of Cord to Ground Plug and insert into nearest grounded electrical outlet on wall, or into Earthing ground rod cord if you use a ground rod connection. The mat is conductive on one side only. Versatile uses: Sitting or laying in a chair or sofa, sleeping upon, wrapping around areas of discomfort from the neck, chest and upper back, to tummy and lower back area, to thighs and lower legs. Use intuitively.